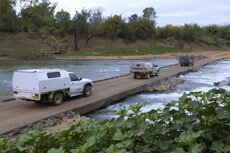 The Daly River Crossing, the heart of the region,is about 110km west off the Stuart Hwy. 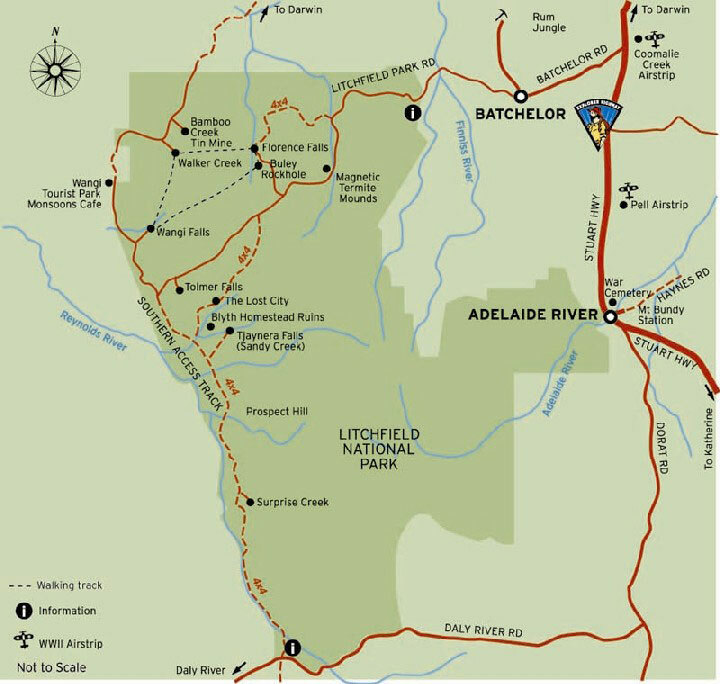 The turnoffs are at either end of the Scenic Route, just north of Hayes Creek or just south of Adelaide River. The Daly River road can also be accessed through the Litchfield National Park with four-wheel drive during the dry season only. Today the town is little more than a smaller pub with a couple airconditioned motel style units, a police station, and a small campground-caravan park. 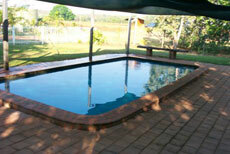 It is exotically located on the banks of the river a couple of kilometres from the beautiful Daly River Crossing. 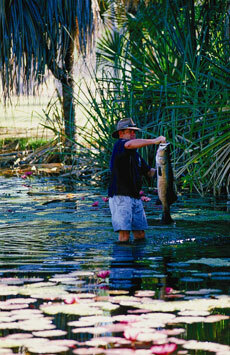 Removed from the main tourist route by a reasonable dirt road which runs 77 km from the turnoff at the Stuart Highway, this small settlement is a centre for visitors wishing to explore the beauties of the Daly River Nature Park and fishermen eager to catch that elusive king of fishes - the barramundi. 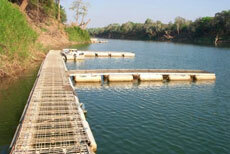 There are locals who are prepared to declare that the best barramundi in the Territory are caught in the Daly River. 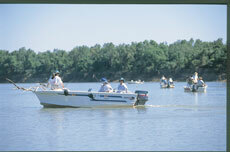 The Daly River region is located between Darwin and Katherine. Hot springs, gorges and unique ecosystems make for great camping and bushwalking. Located 224 km south of Darwin. The river was discovered in 1865 by Boyle Travers Finniss, the first Premier of South Australia and Government Resident in the Northern Territory. 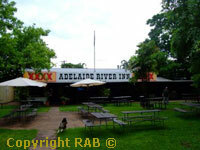 Finniss named the river after Sir Dominick Daly, the Governor of South Australia. 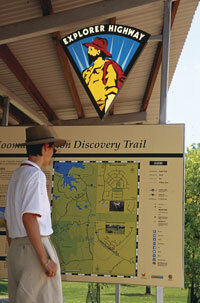 Banyan Farm Tourist park offers shady powered and un-powered sites. 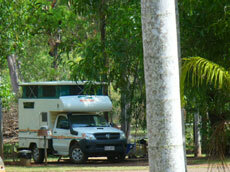 There are many well shaded sites for tents and caravans! All sites are close to facilities. <<< The photo on the left the Daly River Mango Farm Actually you can also stay at the Daly River Mango Farm - a place for accommodation and fishing. 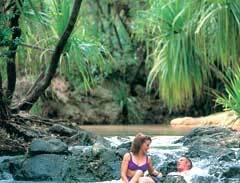 <<< The photo on the left the Tjuwaliyn Douglas Hot Springs Located 130 kilometres from Katherine, these hot springs are surrounded by tropical woodlands and hold water up to 60 degrees Celsius. 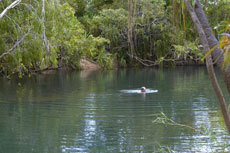 Swimming is only recommended downstream where warm and cooler waters converge. 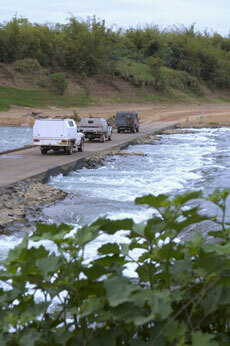 There's plenty of wildlife in the area and visitors are catered for in a large camping area with basic facilities. 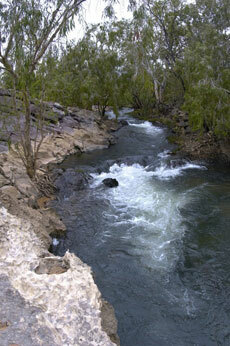 Just east of the Daly River is the area known as the Douglas Daly. It is home to the popular Douglas Hot Springs. In certain parts, the springs bubble at temperatures reaching 60 degrees Celsius and swimming is recommended in cooler pools downstream. There are plenty of camping and caravan facilities in the region, including the Douglas Daly Tourist Park where you can swim through The Arches, an amazing natural formation, into a waterhole that’s safe for swimming. Location: Stuart Highway Adelaide River. Merrepen Arts Centre and Gallery The Merrepen Arts Centre is in Nauiyu Community, near Daly River. Its modern gallery showcases traditional cultural expressions through a variety of mediums, like authentic Aboriginal acrylic paintings, screen prints, batik and hand printed fabric, silk paintings, weaving and cards. Visitors can watch artists creating their work at the Centre. <<< The photo on the left the Butterfly Gorge Nature Park This quiet gorge is part of a sandstone plateau, 200 kilometres north of Katherine and accessible by four-wheel-drive only. The pools are lined with paperbark trees over 50 metres high and the crevices in the rock faces are inhabited by thousands of butterflies. Swimming is safe but camping is not permitted. <<< The photo on the left the Douglas River Esplanade, Douglas Daly Region The river starts where the Katherine and Flora Rivers meet encompassing the areas of the Douglas Daly and Daly River regions. 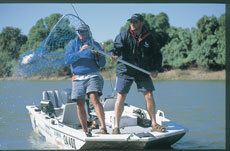 Famed for its large barramundi, the Daly is one of the more popular waterways for recreational fishing, with two major fishing competitions held annually, the Barra Classic and the Barra Nationals. 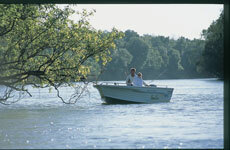 This Conservation Area protects part of the Douglas River and its riverine wildlife. Along the river, springs bubble to the surface from underlying groundwater aquifers forming quiet, shady pools, rushing cascades, thermal pools, sandy beaches and unusual limestone formations. 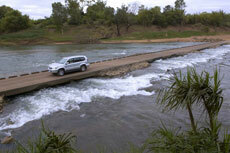 If you are travelling south from Darwin, take the Old Stuart Highway scenic route from Adelaide River. If travelling north, take the scenic route just north of Hayes Creek, then take the Oolloo Road until you reach the Douglas Daly Park. <<< The photo on the left the Umbrawarra-Gorge Butterfly Gorge Nature Park is another popular attraction and can be reached 17 kilometres past the Douglas Hot Springs turn-off and the last few kilometres are suitable for four-wheel-drives only. The Gorge attracts thousands of butterflies seeking shelter in the crevices of its sheer rock faces. • Fishing Tackle and Gift Shop • Dinghy hire • Fishing Rod and Reel hire and repair service • Ice, Gas • Marine Repairs Driving to Perry's on the Daly from Darwin just follow the Stuart Highway south to Adelaide River(113km),then just over the bridge turn right, cross over the new Alice to Darwin railway line and travel 32 km to the Daly River turn off. 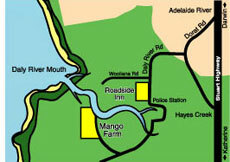 Turn right (west) and follow some 84 km of fully sealed road to the Daly river crossing. Once over the crossing just follow the tourist signs along a good gravel road for 14 km to arrive at Perry's located on the western bank of the Daly River, 8km north (downstream) of the crossing. 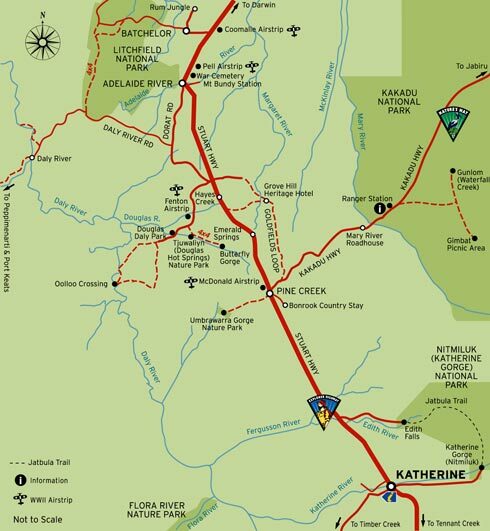 From Katherine travel north to Hayes Creek (great place for a cuppa), just north turn left at the Douglas Daly region sign.Travel to the Daly River road and turn left (west) and follow the tourist signs. The Merrepen Arts Festival will be held at the Nauiyu Community at DalyRiver. (2.5 hours drive from Darwin now a bitumen road all the way. There is no entry permit required and for further information contact Merrepen Arts on telephone 8978 2533. 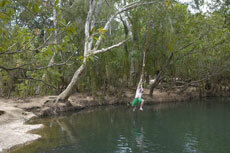 Town of Batchelor the gateway to Litchfield national Park just 90 miutes drive from Darwin on the Stuart Highway. City of Darwin, The capital of Northern Territory Australia also known as the Top End. The city of Darwin is 90min away from Litchfield National Park. • Take your adventure OFF-ROAD! • Spacious and feature rich! • Know what you're paying for! 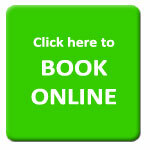 email and ask us for a choice of Australia selfdrive rentals with our specials and promtional offers available. Minimum rental is 5 days return or 7 days minium oneway. Tours, Safaris, Personal Charters being upmarket camping, basic camping and accommodated ranges to Kakadu National Park from Darwin and return. 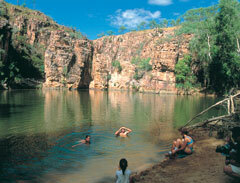 Adventure Tours Australia also offer oneway tours to and from Kakadu to other states.